A long-standing debate in the commercial stem cell arena has focused on whether stem cells grown in a lab prior to clinical use as a transplantation product are biological drugs subject to full FDA vetting. The alternative view has been that such stem cell products are not drugs, but rather are simple human cellular and tissue products. That debate, at least operatively, would seem to be over with a ruling today by the federal D.C. Court of Appeals supporting the FDA position that stem cells grown in a lab are in fact drugs. The decision came on an appeal of a lower district court ruling in USA v. Regenerative Sciences case, which had also supported the FDA position. GRIFFITH, Circuit Judge: In this civil enforcement action, we must decide whether the appellants—three individuals and a related corporate entity—violated federal laws regulating the manufacture and labeling of drugs and biological products by producing, as part of their medical practice, a substance consisting of a mixture of a patient’s stem cells and the antibiotic doxycycline. Because we conclude that they did, we affirm the district court’s judgment and the permanent injunction it entered against appellants. The Procedure begins with the extraction of a sample of a patient’s bone marrow or synovial fluid. From that sample, Regenerative Sciences isolates mesenchymal stem cells (MSCs), which are capable of differentiating into bone and cartilage cells. The MSCs are then placed in a solution to culture them—that is, to cause them to divide and proliferate. Other substances are sometimes added to the solution that affect the MSCs’ differentiation. The culturing process determines the growth and biological characteristics of the resulting cell population. When the MSCs are sufficiently numerous for re-injection, they are combined with doxycycline, an antibiotic obtained in interstate commerce and used to prevent bacterial contamination of the MSCs. The resulting mixture (the Mixture) is injected into the patient from whom the stem cell sample was initially taken, at the site of the damaged tissue. In its ruling the Court emphasized it was not simply deferring to the FDA opinion on the matter, but made the ruling based on evidence. I asked Dr. Chris Centeno, the leader of Regenerative Sciences, a few questions about his reaction to today’s ruling. What’s your take on the ruling? 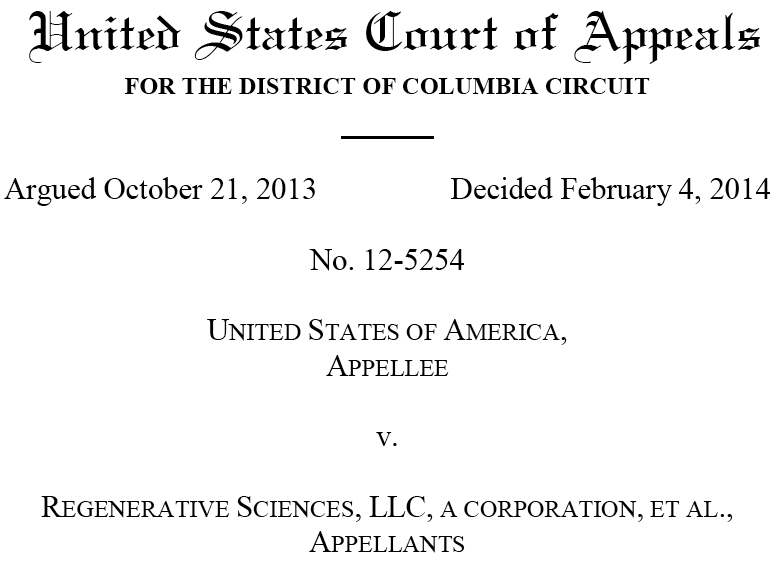 Centeno: The DC Circuit agreed with the FDA’s position. Not much more to it. Was it just a “yes/no” kind of situation or are there subtleties to what the court said? Centeno: They basically said that a physician producing what the FDA considers a drug (in our case culturing autologous MSCs) is subject to FDA federal drug rules and isn’t practicing medicine. What’s next for Regenerative Sciences? Appeal to Supreme Court? What would that entail? Centeno: We will abide by their ruling as we have done since August of 2010. At that time we got our first written indication of a formal FDA position and we complied by no longer culturing cells at our Colorado medical practice. We will make every effort to continue to comply and we will not pursue appeal to the Supreme Court. The ruling along with Dr. Centeno’s indication of there most likely being no further appeal would seem to cement as the law of the land that propagated stem cells, even when used in an autologous context, are drugs, particularly when mixed with other substances or in other ways more than minimally manipulated. This development confirms my #8 prediction for the stem cell field for 2014 and I support this ruling. Excuse my ignorance, but how would this ruling affect doctors using blood/marrow stem cell transplants to treat certain cancers or blood or immune deficiency diseases? As stated in the original court case, the transplants you are referring to are part of Public Health Services Act Section 361, and governed as HCT\Ps and have no impact. This particular case was discussing whether products that are not direct MSC transplants but manipulated MSC for cell therapy use can be governed by the existing PHS Section 351 as a Cell Therapy product or under the “practice of medicine” governed by the overseeing state laws. Both the original case and the appeal resulted in the ruling favoring the legitimacy of the PHS Act. Big Pharma/FDA business model is applied to a cultured autologous therapy it becomes prohibitively expensive. So it will never happen in USA. FDA advanced the-state-of-the-art from epsilon to 0. The good news, it’s a big world. This case is about culturing MSCs but it also indirectly applies to extracting stem cells from adipose. I don’t agree with the idea that SVF is a biologic drug but vetting of the output and independent standards are needed regarding any technology that claims to extract SVF. The idea that an uninformed patient could go to a clinic in the U.S. but not know enough to question the quality of the SVF output is a big problem from both a safety and efficacy standpoint. Worse, there is probably a 50%/50% chance that the patient will leave there feeling better by virtue of the placebo effect, especially in conditions where the symptom is pain, and then proclaim success to the world. Have seen this blinded study that shows the quality of the SVF extracted from four different technologies: http://www.ncbi.nlm.nih.gov/pubmed/24281640. The irony of the study is that the only technology that can not be used clinically in the U.S., under any grey area in current law, is the far superior technology manufactured and designed in the USA! I don’t know what technology is used by the Cell Surgical Network (which you have previously discussed) but it is not Cytori’s and thus it is likely not the best available. We need a framework in the U.S. that will vet all SVF technologies to minimal standards and allow them into the clinic with a registry that will track efficacy and safety. Japan is taking that step, we are not. I understand the issue of safety and it’s very important. However, with the availability of next generation sequencing, you now have the ability to engineer patient-specific therapies. In this n=1 world, I don’t know how the FDA can regulate this type of therapy.